Discussion in 'iPhone and iPad Games' started by metalcasket, Jul 10, 2015. The enchanted forest is in trouble - the Ancient Eggs that sustain the Sacred Tree have been stolen and scattered across the world. 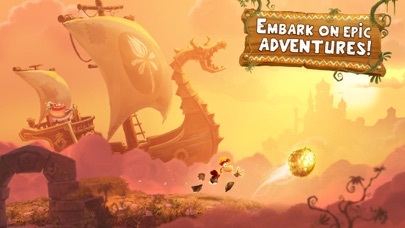 Embark on an amazing adventure through legendary worlds to help Rayman and his friends rescue Ancient Eggs to breathe new life into the Sacred Tree! AN EPIC PLATFORMER! 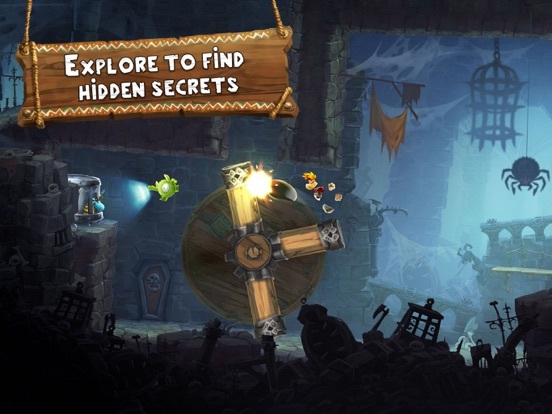 · An exciting mix of timeless adventures and breathtaking visuals! · Over 55 playable characters - play as Rayman, Barbara, Globox, or Teensie! 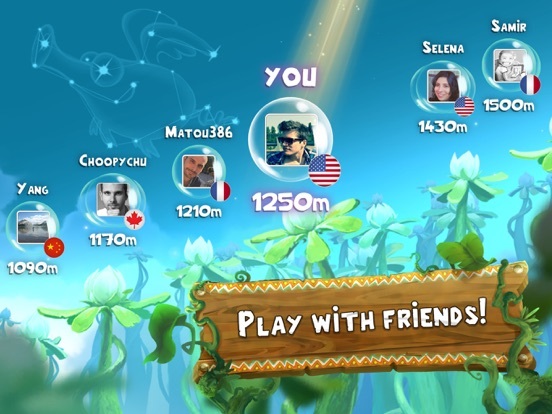 · Run, swim, hover, and take giant flying leaps as you dash through 200+ gorgeous levels! · Jump into the action - battle Minotaurs, Bandits, and many other monsters! EXPLORE VAST WORLDS! 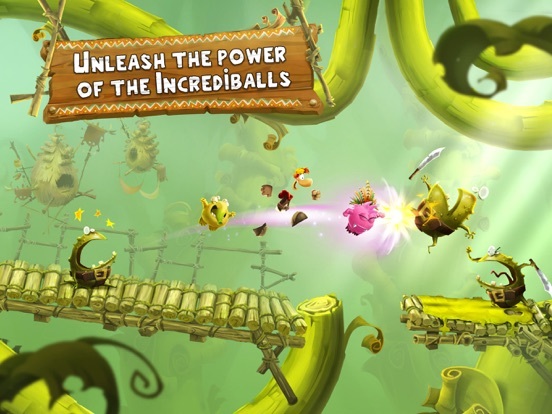 · Explore 7 extraordinary worlds in this action-packed Rayman 2D platformer! · Grow your Sacred Tree to unlock new adventures, and soar above the competition! MEET THE INCREDIBALLS! 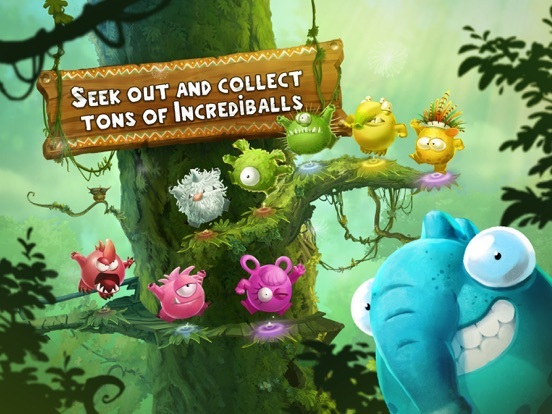 · Collect Incrediballs with 3 Special abilities - Seekers, Inhalers, and Protectors! · Feed the Incrediballs, and make music with them in the Beatbox Mode! · Complete more than 50 various Incrediball families! 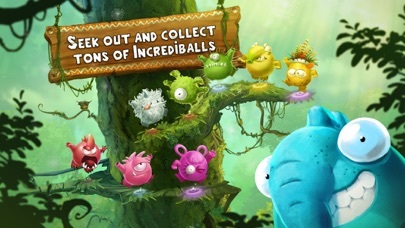 · Seek and collect over 320 unique Incrediballs! Run through various mysterious lands, haunted medieval castles, and the mythical worlds of Olympus, and unravel their hidden secrets! 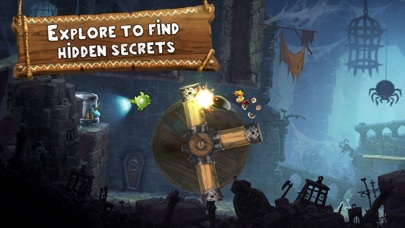 Download this legendary free-to-play Rayman platformer game that takes you on an adventure unlike any other! Game available in: English, French, Italian, German, Spanish, Russian, Brazilian Portuguese, Danish, Finnish, Norwegian, Swedish, Turkish, Korean, Japanese, Arabic and Chinese. 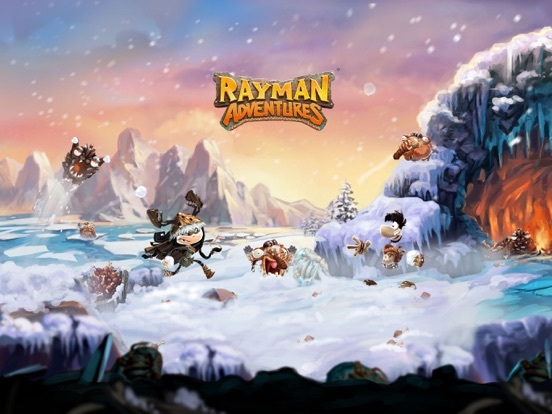 Join the Rayman Adventures Community on Facebook: https://www.facebook.com/RaymanAdventures PLEASE NOTE: This game is free to download and play but some game items can be purchased for real money. You can disable in-app purchases in your device's settings. So huh, it's both a runner AND a level-based game. 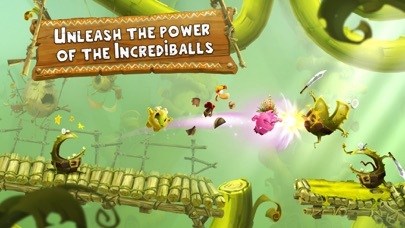 Rayman auto-runs, but you can go forwards and backwards in the levels, and you have things to collect and whatnot. Interesting approach. 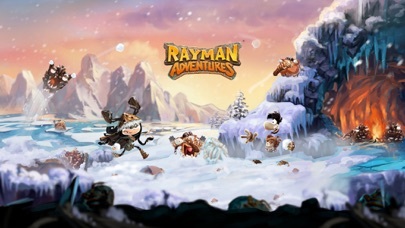 Wasn't sure based on the announcement if this would be another Rayman Jungle Run or what! We lost Rayman but we gained Heroki, I don't mind the trade at all. It's not an endless runner, in fact it's just the opposite. The levels feel even shorter than Jungle Run or Fiesta Run. There are also a ton of menus to navigate through (and the tutorial forces you to see it all). The platforming is very similar to Fiesta Run where you're collecting lums or whatever they are called now. The amount to collect varies by level. There are creatures you save by unlocking eggs which give you similar powers to those in Fiesta Run. You find eggs by playing and can hatch them by either waiting or spending gems which are earned by finding more lums. More lums found per level = more gems = hatch eggs quicker. The longest timer I've seen on an egg is 20 minutes (I'm up to adventure land 3). There are other items to collect through achievements by performing specific moves in the levels. The only one I've got so far is one which halved the egg hatching timer. There doesn't seem to be any restriction on unlocking levels (again, so far) apart from playing them in order on the map one at a time. So to sum up the F2P, it isn't intrusive. Seems so far that most people will easily play without having to pay unless they have a big backlog of eggs they want hatched. But it's the many menus to navigate between the short gameplay levels which is very annoying and intrusive. Gameplay wise it seems a little clunkier gaining control over direction. You now swipe to change direction, and swipe the direction you're already going to attack. Tap anywhere to jump. Swipe down to attack the ground while jumping or while over something breakable. I think I preferred the old control method even if it meant no direction control. Just felt more natural on a touchscreen than swiping everywhere all the time. My iPhone got dirty very fast! I think I prefer Fiesta Run but I'll be playing this for now anyway. Some of the levels are designed so that you NEED to use these creature thingies to be able to collect everything and that's a deal breaker for me. Add timers and dual currencies and it becomes apparent that the game isn't for me. Don't get me wrong, the gameplay is still excellent and as far as I know the free to play stuff doesn't stop you from playing; I can see a lot of people enjoying this. 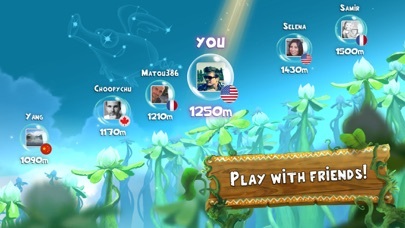 But for me personally it feels like a step backwards for Rayman on mobile; while I was playing I couldn't help but wish I were playing Fiesta Run instead. Not to mention Rayman Legends. Yours is among the rare but deemed trustworthy reviews on TA, so my thanks to you. Yeah... All this just tells me to wait for the worldwide release to check it out, and not worth opening the NZ account for. Hopefully it eventually gets a sort of IAP to get rid of freemiumness if that could apply. I haven't dug into this TOO much this morning (So far I'm on like the 7th level), but as of right now it just seems like good ole' Rayman with a bunch of extra wonky stuff tossed in for people to collect. The gameplay is solid of course. Great visuals and audio, high production values just like the other two games. So far the only timer is on these eggs you find. They need to incubate for a certain amount of time before they hatch into one of these 133 "creatures" that you collect. The creatures kind of assist you in each level. Each creature has a different power or skill. The thing is, they "fall asleep" after being used, so you have to feed them to wake them up in order to use them again. There's a lot of stuff going on. You have creature collecting, gems, food, these scratch-off tickets.....and I'm only on level 6 or 7. I'm still in the tutorial stages somewhat. I will say that I haven't seen any sign of gameplay timers yet, so hopefully nothing like that pops up. Like I said, so far it just seems like a regular Rayman game with a weird meta collecting game added to it. It could easily be a premium game I'm guessing if they got rid of the food part. That way you could use your creatures at any time. These are just my initial imps of the first 10 mins or so. I'll leave some better imps after I dig into it a little more, but so far it's pretty fun. Does this currently support any type of cloud save? doesnt seem too and i have got to a point where it says "can not connect to server check your net connection" funny my connection is fine..... i have noticed on the game option screen this curios thing " server - ???? (wifi)" hmmm? Cloud saving should be working. There must be a problem, and I'm here to help! Could you give me your profileID (even if it is grey) on a private message? It's on the menu, left from <server-???>. Thanks for the gameplay vid! Love the new visuals and environments. The levels look super bite sized and short though. But I also noticed hidden collectables are well...hidden lol. I am a bit more encouraged now to try it out when released. The timers are pretty awful and they just keep getting bigger. There's nothing to do while waiting them out either. This has already been partially said but I wanted to say it again. If this game were premium, it would be really fun! The free to play model is just a sour coating on what would be a sweet game! Although the layout is terrible, we mustn't forget that the actual gameplay is following the rayman tradition and improving everytime. The controls take a while to get used to but will probably turn out to be better than the other games. The new features are awesome and the idea of collecting creatures to help you would be great... It is obvious that a lot of effort has gone into the making of this game, but instead of sticking on a price tag, they buried it in free to play garbage. 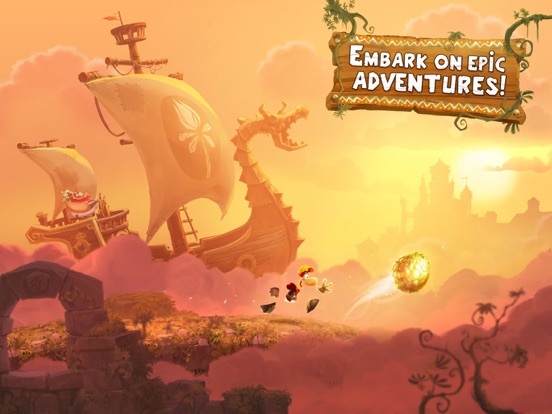 If it weren't for premium currency, timers and the (all too common) value that money is more important than enjoyment, Rayman Adventures would be a terrific game, and we mustn't forget that.